My youngest daughter collects turtles. I gave her one made out of St. Helen’s ash for Christmas that I picked up last July when I visited the volcano. I’ve also given her carved wooden turtles bought during my Africa and Galapagos Island trips a few years back. Finding turtle replicas as I travel is not hard. You can find them in any souvenir store and being hawked by local, enterprising street venders. I guess my daughter isn’t the only turtle collector out there. Having something to collect is part of the fun of traveling. In my earlier days, after realizing I didn’t want a lot of dust collectors around my home, I started a collection of Christmas ornaments. I reasoned I could get them out once a year, enjoy the memories they brought to mind, and then put them away. When my home became a 22-foot RV, I passed the collection down to my daughter. It was a good choice because I still get to recall my past travels when I spend Christmas with her. Today I collect books and pictures as my souvenirs. The books I give away after I’ve read, and the pictures I keep stored on my computer. 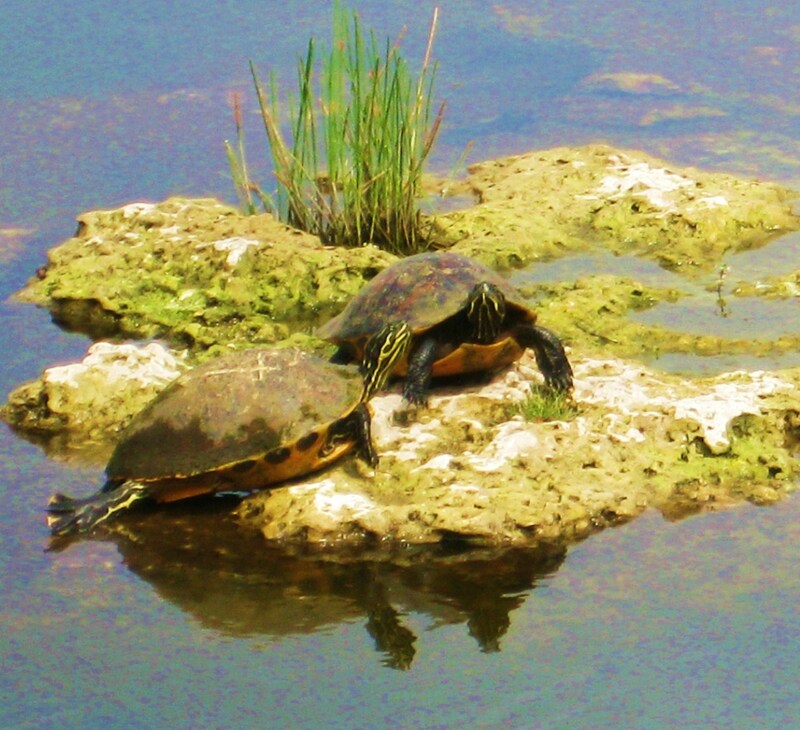 A recent perusal of these photos made me realize, in my own way, that I was a collector of turtles, too. There’s something about the composition of light on water and turtles on a log or rock that prompts me to reach for my camera. I’ve got pictures of the sea turtle I swam with in the Caribbean, pictures of giant tortoises, the land version of the turtle, taken on Isabelle Island in the Pacific Ocean, and numerous pictures of turtles taken all across America. So what’s your favorite souvenir to bring home from your travels? I think we can learn a lot from all the living creatures. PS The turtle-like “big boss” is not my boss, but is a great one to all who work for him, or as he would say, with him. Today’s quote is on the wall in my studio posted just below an amazing poster of a Native American style turtle. 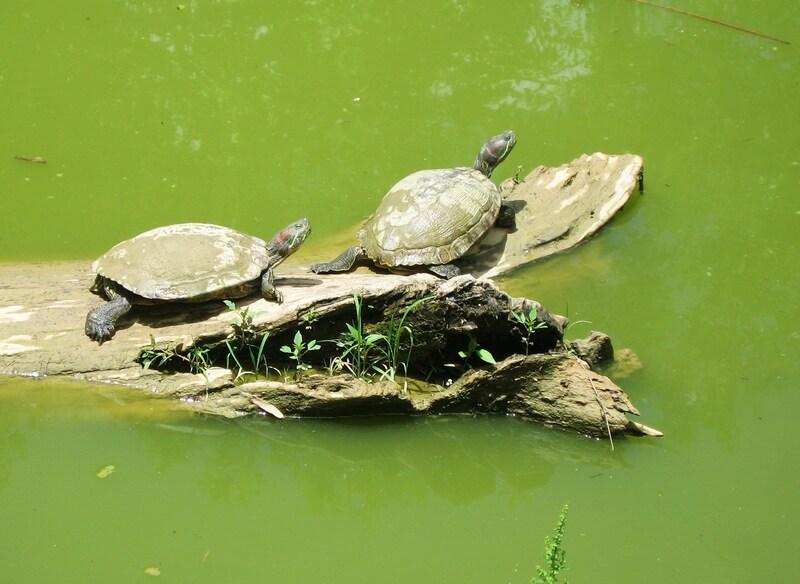 The turtle is my animal totem – slow and steady wins the race. I don’t always win but I am always slow and steady. As for my favorite souvenir to bring home – almost always a book. A book of the region – usually a history. Perhaps a pictorial travelogue of the region. I too do not like to buy too much “stuff” that simply sits and collects dust and takes up space. I’m now aiming toward ebooks to help my groaning bookshelves lose a bit of weight. Photos make the best souvenirs. After all, they help you recall your trip long after it’s over! And you never know when you might need them to illustrate a book or a post. Isn’t it funny how we “collect” with photos? I’ve been trying to downsize (wanting fewer things to dust or care for), but now that you mention it, I’m still collecting. Fortunately I don’t have to dust off this collection since, like yours, it’s in the computer. For me it seems to be trees. I’ve been going through my old photos and noticed I take a lot of pictures of trees. Water comes in second (ponds, lakes, fountains, streams, even a glass of ice water). I still collect Christmas ornaments – and, of course, photos.